Water is quickly becoming an “endangered species” on our blue planet. Urban growth increases stormwater runoff, which in turn harms natural waterways. All life requires water for survival. Becoming aware of the current state of our environmental condition is the first step in identifying viable solutions to ensure clean and healthy water for future generations. Aesthetic Benefits: The RainXchange™ adds the beauty of a water feature to an efficient system for capturing, filtering, and reusing our most precious resource – water! Whether you choose a Pondless® Waterfall or bubbling urn to your landscape, you’ll be happy knowing your RainXchange™ System not only looks great, but is beneficial for the environment, too. Environmental Conservation: Capturing rainwater to operate a decorative water feature creates true self-sustainability, drastically reducing the need for chemically-treated traditional water sources. 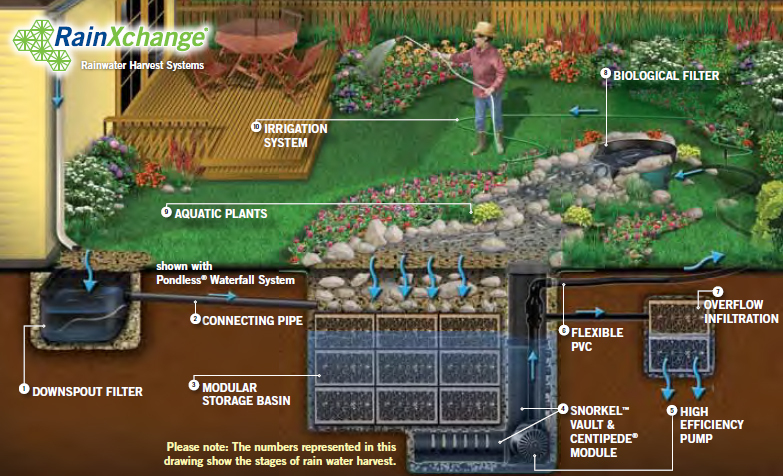 Ease of Use: While you enjoy the benefits of a decorative water feature, the RainXchange™ System filters the stored water to prevent stagnation and growth of unhealthy bacteria. Accessing the stored underground water is easy as connecting a hose to a spigot. A small pump is connected to the stored water making it convenient for you to water the landscape. Copyright © 2014 Living Artscapes, Inc.